Connie Johnson Big Heart Project fundraising amount announced. "I might just pass out." Connie Johnson learns how much her project raised live on air. On Wednesday on an otherwise unassuming netball court in Canberra, hundreds of thousands of five cent coins lay in the sun in the shape of the biggest heart imaginable. They were, of course, carefully placed there by Connie Johnson and Love Your Sister in a bid to raise millions for cancer research. By the end of the day, the netball court was more of a copper-covered pond in the shape of heart, with 300,000 coins dedicated to the belief that our future can – and should – be free from cancer. 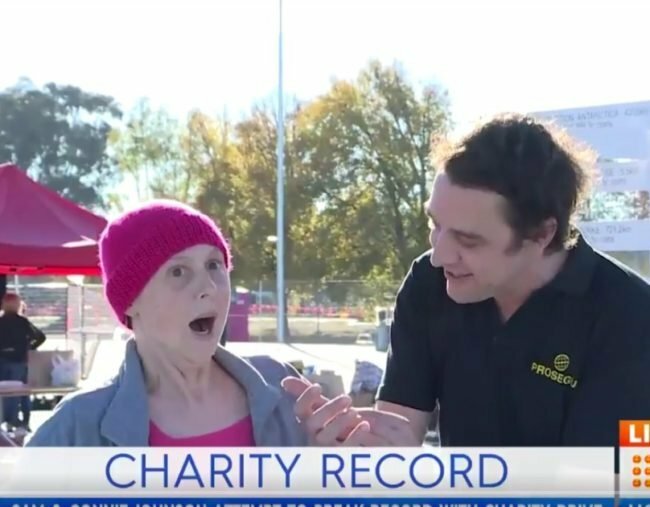 One day on, Sam and Connie graced The Today Show to announce the figure raised from the project, with Sam keeping the final figure from Connie to surprise her on air. “Look I’ve just updated the most recent report and it’s as accurate as it can be but donations are still coming in. It’s still ticking over. I checked it two minutes ago. Connie doesn’t know where we’re at. I held it from her,” he told the show, adding they managed to raise more than $2.2 million. “It was amazing. It was just a big heart shaped wishing well where we could all reflect on what the cancer free future means to us,” he said. For Connie, it was a figure that left her a “bit speechless”. “I might just pass out,” was about all she could muster upon hearing the news. For brother and recent Gold Logie winner Sam, it was a number they never considered reaching. “We dreamed of a million dollars – to be honest we wanted to raise $200,000 to break the record. Then when we raised that quickly we adjusted it to a million dollars thinking if only,” he told the program. To think they could double it. And then some.